Thu 25th Household Division Concert Series: The Countess of Wessex's String Orchestra in the Guards' Chapel at 7.00pm. Spring Concert. Free admission, retiring collection. Tue 30th Guards' Chapel Recital Series at 13:10hrs in the Guards' Chapel, Birdcage Walk, London SW1E 6HQ. Two Horns and String Quintet. Free admission, retiring collection. Wed 15th Household Division Concert Series: The Central Band of The Royal British Legion in the Guards' Chapel at 7.30pm. 'In Town Tonight'. Free admission, retiring collection. Thu 16th Household Division Concert Series: The Countess of Wessex's String Orchestra in the Guards' Chapel at 7.00pm. Free admission, retiring collection. 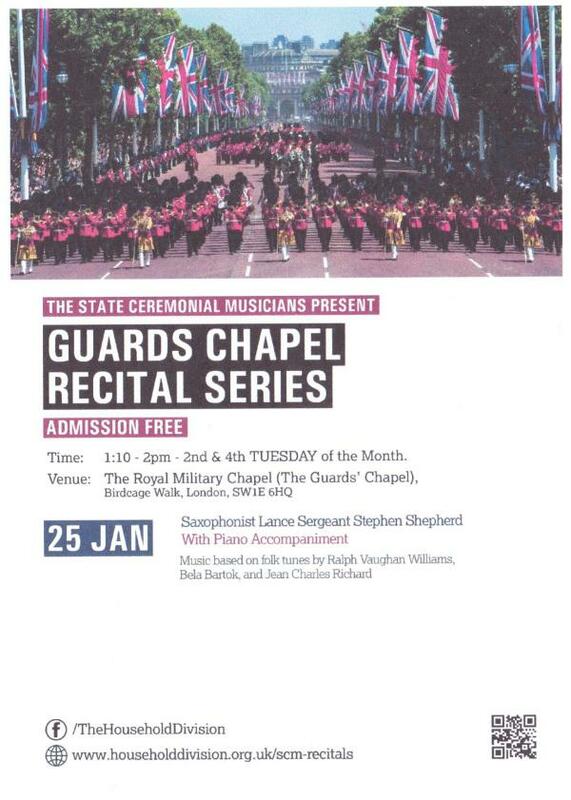 Tue 28th Guards' Chapel Recital Series at 13:10hrs in the Guards' Chapel, Birdcage Walk, London SW1E 6HQ. Scots Guards Piano Duo. Free admission, retiring collection. Mon 3rd - Wed 5th The President of The United States of America, President Donald J. Trump, accompanied by Mrs Melania Trump, has accepted an invitation from Her Majesty The Queen to pay a State Visit to the UK. Mon 3rd Coronation Day: 41 Gun Salute by the KTRHA in Green Park at noon and by the HAC (62 guns) at Gun Wharf, Tower of London at 1300 hours. Mon 10th HRH The Duke of Edinburgh's Birthday: 41 Gun Salute by the KTRHA in Hyde Park at noon and by the HAC (62 guns) at Gun Wharf, Tower of London at 1300 hours. Tue 25th Guards' Chapel Recital Series at 13:10hrs in the Guards' Chapel, Birdcage Walk, London SW1E 6HQ. Guards Big Band. Free admission, retiring collection. Thu 18th Household Division Concert Series: The Countess of Wessex's String Orchestra in the Guards' Chapel at 7.00pm. Free admission, retiring collection. Tue 30th Guards' Chapel Recital Series at 13:10hrs in the Guards' Chapel, Birdcage Walk, London SW1E 6HQ. Chamber Ensembles from the Band of the Scots Guards. Free admission, retiring collection. Thu 14th HRH The Prince of Wales Birthday: 41 Gun Salute by the KTRHA in Green Park at noon and by the HAC (62 guns) at Gun Wharf, Tower of London at 1300 hours.